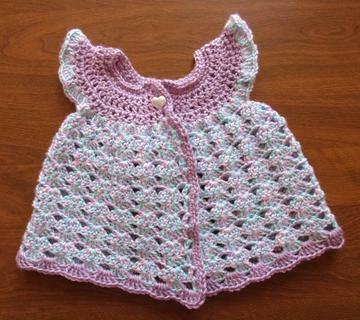 Note: When crocheting this pattern, you will be crocheting through both the front and back loops. Ch 52 sc in second ch from hook going through the front and back loops and in each ch across ch3 and turn. 51 sts. Round 5: 1dc in the same st, shell in next 6 shells, ch3, skip 10 shells, shell in next 11 shells, ch3, skip next 10 shells, 2dc in top of ch3, ch3 and turn. Round 6: 1dc in same st, shell in next 6 shells, 1dc in each of the next 3 chs, shell in next 11 shells, 1dc in each of the next 3 chs, shell in next 6 shells, 2dc in top of ch3, ch3 and turn. Round 8: 1dc in same st, shell in each shell to end, 2dc in top of ch3. Round 9-16: repeat row 8. Round 17: 1dc in same st, shell in each shell to end, continue on by single crocheting around the border, and connect with a slip stitch. Sew a larger button (or 2 smaller buttons) on the top of pinafore sweater (see image), and use space between double crochet and single crochet border for your button hole.